At Datamax Arkansas, we cover a whole lot of ground when we say, “We’ve got you covered!” As a premier business technology provider for 60 years, we believe we’ve covered all the bases in our pursuit to offer the very best empowering technology solutions and services. 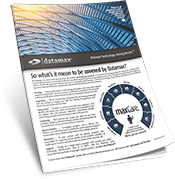 From IT to MFPs, Datamax can help maximize YOUR Return on Technology Investments through MaxCare®, the industry’s most comprehensive portfolio of technology support services. 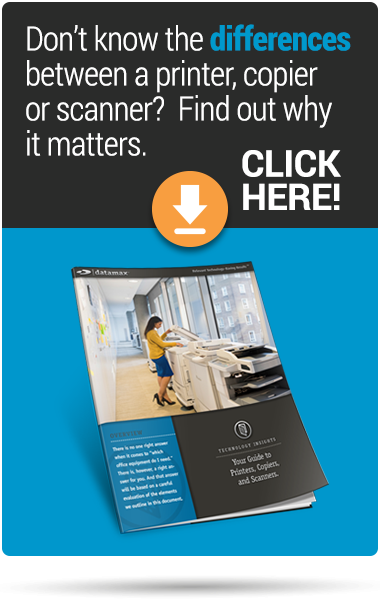 The following are three of the powerful support programs we offer for your office equipment including, copiers, mfps, printers, production print systems, and wide-format printers. Datamax understands that even the most advanced technology solutions in the world are of little value without ongoing support. That’s why we are dedicated to delivering world-class solution management – far beyond the transaction. Every Datamax solution is backed by our Total Solution Management approach that helps our clients escape the worry, inconvenience, and lost time associated with managing technology. ImageCare offers industry-defining service and support – in writing – for every facet of our office equipment solution. Plus, client-empowering programs and guarantees are built into each of our agreements. Learn more about ImageCare. We don’t just implement technology solutions. We “strategically orchestrate” them – around your workplace, your employees, your information flow, and, most importantly, your business objectives. Our breadth of experience and team-based approach enable us to pinpoint your needs and creatively unite disparate technologies to implement solutions that harness technology to help achieve your business goals. We ensure the smooth implementation of Datamax solutions by employing methodical project planning documents and carefully crafted agreements that we honor throughout the contract. ConnectCare – used to streamline the integration of our clients’ advanced printing systems – allows us to establish that client needs are met, the proper technology infrastructure exists to support connectivity and a foundation is in place to achieve results worth raving about. Learn more about ConnectCare. Our goal is simple – to help businesses make smart decisions regarding technology. However, as a single-source provider also offering superior service and in-house leasing, we understand smart decisions involve more than the technology itself. From pre-sale to post-sale and beyond, our primary focus is on delivering responsiveness, flexibility, and a business relationship of close accountability. Our ability to provide single-source financial services through our own leasing company (DATAMAX Leasing Division) empowers our clients to gain maximum control over their business finances – and their budget. Learn more about LeaseCare. Other agreements we offer under MaxCare® include PrintCare, DocCare, CloudCare®, and TechCare® for IT network management. If you are looking for more freedom to focus on your forte—managing your business, not your technology, consider Datamax. We’ll help you maximize the technology that matters to you. Datamax can overlay your entire technology infrastructure, from IT to MFPs, with a comprehensive portfolio of managed support services we proudly call MaxCare.